Hi! I am Tony Anthonisen. I am a ukulele player. There, I have said it. The uke is a wonderful instrument - a real instrument that brings a ton of fun to those who play it! I'd like to share some of the true enjoyment that comes from playing music with friends. 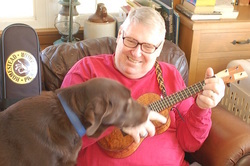 Uke-4-Fun.com will feature a bunch of information about playing the ukulele in Minnesota. Uke clubs, uke jams, uke singalongs and more. Uke-4-Fun.com is where you will discover the world of ukulele fun stuff in the Twin Cities. Some say the uke is not appropriate for much other than Hawaiian music. I say that if it sounds good to you, and if it is fun for you, do it. Do an "all uke" bluegrass or Americana jam for a ton of fun! Throughout this website, items in blue are usually links. Ukulele "Stuff" - Info about a great ukulele movie, ukulele books, websites, instructors, uke jamming pointers and more! Twin Cites Uke ClubTwin Cities Ukulele ClubTwin Cites Ukulele Club - The TC Uke Club has many uke jams and group lessons every month. For beginner to expert ukulele players. Join us for BUG, BUZZ, Wednesday Noon, Friday Morning and UkeAmericana singing and uke playing. Why I Like Twin Cities Ukulele Club Jams - Check out why ukulele players like jamming with the Twin Cities Ukulele Club. Other Ukulele Resources - Like Homestead Pickin' Parlor, Flea Market Music and others. Because You just never see someone playing a uke without a smile on their face!